Raphael Dabbah, Numismatic Studies, Jerusalem, 2013, ISBN 9789659065028. Hardcover, full color, 336 pages, limited print of 125 books, generally not available for sale. This book is the second of two monographs by IBNS member Raphael Dabbah. In 2005, Dabbah published the book Currency Notes of the Palestine Currency Board, a work that is considered by many to be the definitive research on Palestine bank notes. One of the intriguing topics in that book was the emergency notes of Palestine, Syria, Lebanon, and Djibouti, all of which were designed and engraved by Emil Pikovsky Zincography in Jerusalem during World War II. The topic was briefly touched upon as the book was devoted primarily to the Palestine issues. Subsequently, Dabbah dedicated over five years to conduct an intensive, challenging, and comprehensive study in which hundreds of documents were uncovered and consulted. The fruit of this labor is Printed in Palestine, an independent comprehensive study that is also a natural continuation of the first volume. The book is divided into four chapters. As virtually all of the bank notes described and discussed in the book were issued by the French, it only makes sense that the first chapter presents a detailed historic context of the French Empire during the World War II era. The second chapter presents the history of the Pikovsky Zincography, including its owners, other work such as passports, stocks and bonds, and other documents. 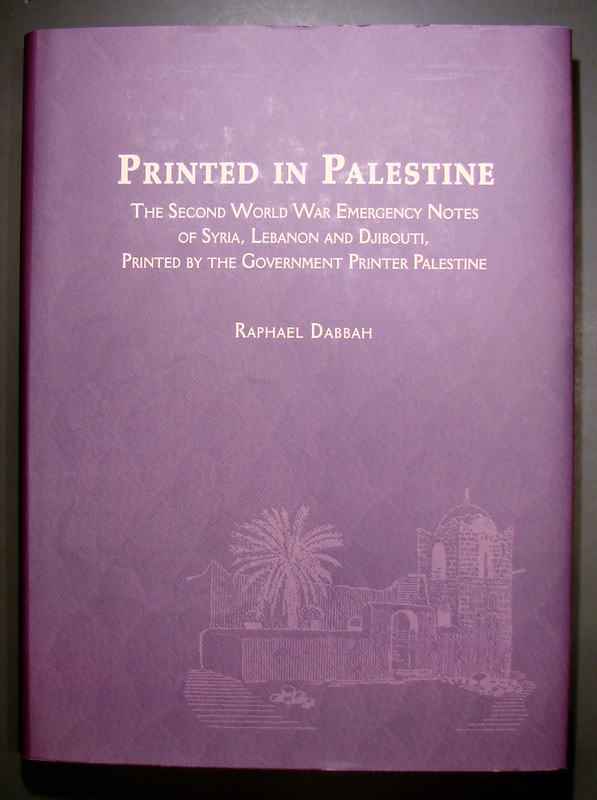 A secret printing of emergency bank notes is also discussed, before stepping into the third chapter, which delves into the French Levant history and monetary background, followed by a section covering the Syrian and Lebanese bank notes prepared by Pikovsky, together with an impressive parade of illustrations that include circulating notes, specimens, proofs, and other material. The fourth and last chapter presents in similar style the history of the French Coast of the Somalis (Djibouti), followed by details of the notes printed by Pikovsky. Despite the great scarcity of adequate documentation related to the subject, information was collected successfully from archives, bank note collections and collectors, making it a unique and ground breaking study. The book runs to 336 pages and includes color illustrations of all known notes, identified by date and prefix, as well as numerous proofs and die proofs of unissued designs, sketches and much more. Many of the designs are published for the first time and some are illustrations of the only recorded examples known in existence today. The book is a refreshing addition to the global numismatic library, and I encourage any serious scholar or collector of that region to study this book as it is filled with previously unknown but important material. This entry was posted in General and tagged book review, Djibouti, Lebanon, Palestine, Raphael Dabbah, Syria.